Current Topics in Membranes provides a systematic, comprehensive, and rigorous approach to specific topics relevant to the study of cellular membranes. 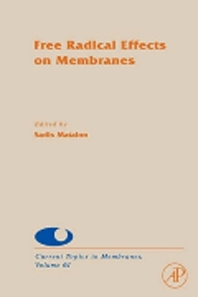 This volume consist of eleven chapters from experts in the field that encompass free-radical effects on diverse membrane functions, ranging from selective barrier functions, controlling membrane protein function to discussing how the hydrophobic environment within membranes regulate free radical reactivity. The focus is on articles discussing specific examples in which membranes from different cellular compartments (e.g. plasma, ER, mitochondria) and membrane proteins either regulate reactive species formation and reactivity or are specific targets of reactive species leading to alteration in function.